Tommy Rowe is prepared to take the slow and steady approach on his return to action to ensure he can be a major player for Doncaster Rovers for the rest of the season. The Rovers captain returned off the bench in Saturday’s 2-1 win over AFC Wimbledon and netted the winning goal. But he admitted he is not keen to push himself too hard in the early stages of his comeback and risk not being able to play regularly during the remainder of the campaign. “I said to the manager in terms of what I wanted to come back and show him,” he told the Free Press. “If we manage it well over the next month, I want to be that player that I’ve been for this club in the two and a half years that I’ve been here. “I want to be someone we can depend on going into the new year and the second half of the season who can play regularly. Initial plans were for Rowe to return in one of the two cup ties against Chorley or Notts County earlier this month. But there was then an easing off in expectation, with the midfielder’s comeback pushed to this weekend’s derby with Barnsley. 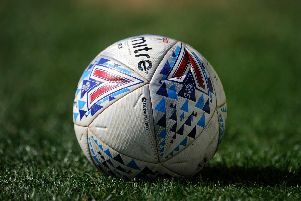 Boss Grant McCann then decided Rowe was ready to play some part against Wimbledon – a choice which was justified when he drilled home Rovers’ first winning goal in seven matches. And the 29-year-old – who also came off the bench against Chorley on Tuesday – says the impressive return provided him with a considerable boost. “Confidence is such an important thing as well as fitness and sharpness,” Rowe said. “Saturday gave me so much confidence and that is something alone that can spur me on even more and get me to the levels I need to be at even quicker.